Sporting a sleek design and a shiny black finish, the modern and user­-friendly Panasonic KX­TGC 225EB cordless phone comes equipped with an answering machine and innovative call management features including the ability to block up to 30 numbers which you don't want to hear from. An affordable solution, this phone was also given the Which? Best Buy award. 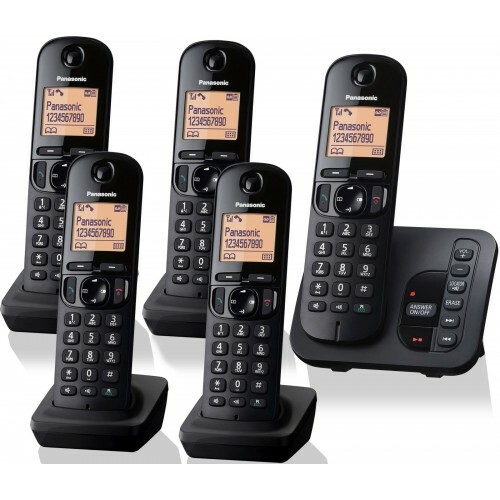 The KX­TGC 225EB has a stylish design with an ergonomic handset and a base station featuring intuitive controls for handling answering machine messages and more. The handset is also equipped with a large 1.6" LCD display with large and easily readable text. The buttons, screen and other elements of the phone are designed to be as ergonomic as possible, while the compact design affords installation in a tight space too. You can make nuisance phone calls something of the past with the KX­TGC 225EB, thanks to the provision of a call blocking list allowing you to block up to 30 numbers from people you don't want to hear from. This feature requires that you subscribe to the Caller ID service, which will be available from your landline provider. Convenient and affordable, the Panasonic KX­TGC 225EB cordless phones provide everything that home users need for everyday functionality. The first four handsets more or less set themselves up having set one to the correct date and time. The fifth one took a little longer but we got there in the end. Good set of 5 telephones. All working well. Volume control good. Good value. I need five phones due to the layout of my house. The answering machine part is very good, much better than my previous Panasonic. The range of the phones is excellent and the clarity better than anything before. Easy to set up and a an excellent range with the panasonic dect extender - good value.